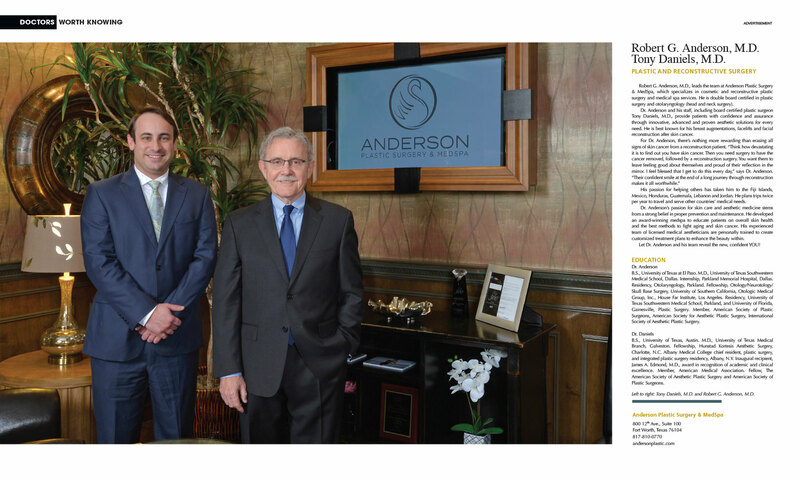 Robert G. Anderson, M.D., leads the team at Anderson Plastic Surgery & MedSpa, which specializes in cosmetic and reconstructive plastic surgery and medical spa services. He is double board certified in plastic surgery and otolaryngology (head and neck surgery). Dr. Anderson and his staff, including board certified plastic surgeon Tony Daniels, M.D., provide patients with confidence and assurance through innovative, advanced and proven aesthetic solutions for every need. He is best known for his breast augmentations, facelifts and facial reconstruction after skin cancer. His passion for helping others has taken him to the Fiji Islands, Mexico, Honduras, Guatemala, Lebanon and Jordan. He plans trips twice per year to travel and serve other countries’ medical needs. Dr. Anderson’s passion for skin care and aesthetic medicine stems from a strong belief in proper prevention and maintenance. He developed an award-winning medspa to educate patients on overall skin health and the best methods to fight aging and skin cancer. His experienced team of licensed medical aestheticians are personally trained to create customized treatment plans to enhance the beauty within. Let Dr. Anderson and his team reveal the new, confident YOU! B.S., University of Texas at El Paso. M.D., University of Texas Southwestern Medical School, Dallas. Internship, Parkland Memorial Hospital, Dallas. Residency, Otolaryngology, Parkland. Fellowship, Otology/Neurotology/Skull Base Surgery, University of Southern California, Otologic Medical Group, Inc., House Far Institute, Los Angeles. Residency, University of Texas Southwestern Medical School, Parkland, and University of Florida, Gainesville, Plastic Surgery. Member, American Society of Plastic Surgeons, American Society for Aesthetic Plastic Surgery, International Society of Aesthetic Plastic Surgery. B.S., University of Texas, Austin. M.D., University of Texas Medical Branch, Galveston. Fellowship, Hunstad Kortesis Aesthetic Surgery, Charlotte, N.C. Albany Medical College chief resident, plastic surgery, and integrated plastic surgery residency, Albany, N.Y. Inaugural recipient, James A. Edmond, M.D., award in recognition of academic and clinical excellence. Member, American Medical Association. Fellow, The American Society of Aesthetic Plastic Surgery and American Society of Plastic Surgeons.